First introduced as a 1993 model, the Nissan Altima was billed as all-new for 2013. With a combination of innovative mechanical components, carefully tuned ride and handling, advanced cockpit connectivity features and sleekly contemporary styling that belies its price class, the fifth-generation Altima feels like it's a class above its mid-size segment while providing comfortable, efficient family transport. Chrome exhaust finishers have been added to the 2.5 grade for 2014. Nissan's available navigation system has added smartphone integration for iPhone and Android, SiriusXM Travel Link, and SiriusXM Weather. All seven Altima models have Nissan's Xtronic continuously variable transmission (CVT) as standard. Each Altima is a four-door sedan, as Nissan has discontinued the two-door Altima coupe. Most Nissan Altima models will come with a 182-horsepower, 2.5-liter four-cylinder engine, but a vigorous, upscale 270-horsepower, 3.5-liter V6 is available. The thrifty four-cylinder combines with the latest Nissan CVT (Continuously Variable Transmission). The result of 20 years of refinement, this drivetrain results in a segment-leading 38 mpg EPA Highway estimate. That's better than Ford Fusion Hybrid, Chevrolet Malibu ECO, Hyundai Hybrid or any other competing mid-size sedan. The four-cylinder gets a 27-mpg EPA City rating. Contributing to fuel-efficiency are tires with reduced rolling resistance, and a regenerative alternator that operates only when the Altima is cruising. With the V6 engine, the fuel-economy estimate shrinks to 22/31 mpg City/Highway. We found the Altima 3.5 with the V6 engine a brilliant performer, but the Altima 2.5 with the four-cylinder engine delivered just average performance. Inside, the top-of-the-line Altima SL trim was very luxurious, and the SV trim with cloth upholstery was also very nice. All of the Altimas are very quiet when underway. 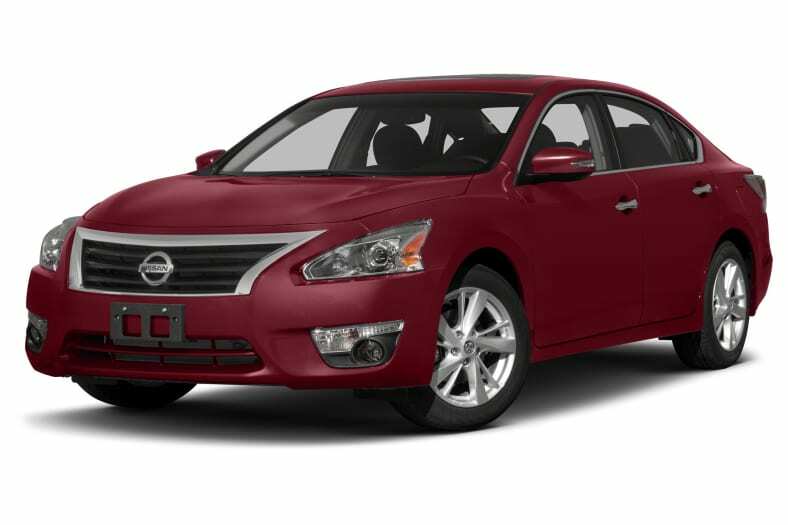 Combine headline-making fuel efficiency with a variety of features and creature comforts not generally found in non-luxury mid-size sedans, and the Altima makes a stylish, affordable and tempting choice for families working their way up the scale. In fact, for some time the Altima has been shouldering its way into Nissan Maxima territory. Available features include such pleasantries as leather-appointed seating, as well as safety features like blind-spot and lane-departure warnings, and a moving object detection system.